This article gives step by step instructions for how to import folders from another profile for a new user who has never installed an extension. It assumes you're using Windows but you should still be able to follow the instructions using a file manager on another operating system. The ImportExportTools extension can also be used to export folders. Go to this web page and click on the download now button. Choose "save file" and press the OK button to save the file when the popup asks what should Firefox do with that file. Go to Tools -> Addons -> Extensions. Select the icon that looks like a gear near the top of the window and then select "Install add-on from file" from the list box. If you can't find the gear like icon you are probably looking on the Get Add-ons pane, not the Extensions pane. Browse to where you downloaded the .xpi file, select it and press Open. It will then display a "Software Installation" screen with a grayed out "Install" button. After a couple of seconds it will finish processing the .xpi file and replace that button with a "Install Now" button. Press the button. Start Thunderbird again. It should now have a Tools -> ImportExportTools -> "import mbox file" command. Don't use it yet, just check that it exists. If you can't download the add-on the problem might be due to a optional download manager. One way that could occur is if it changed the file extension from .xpi to something else. However, it is also possible to find and install the add-on from within Thunderbird. The reason why its a fallback plan is the "search for add-ons" feature in Thunderbird doesn't find many add-ons. However, it does find this one. Go to Tools -> Addons -> Extensions. Type importexporttools in the "Search on addons.thunderbird.net" field in the upper right corner. Obsolete versions of Thunderbird might have different text in that field such as "Search for add-ons". It should display the ImportExportTools add-ons web page within a tab in Thunderbird. Click on the orange "+ Add to Thunderbird" button. Your folders are stored as mbox files in a profile. These are text files with the folders name and no file extension. For example your inbox folder is the "inbox." file and the Sent folder is the "Sent." file. You can safely read one using a text editor to verify it contains mail messages though its not user friendly because it contains the raw message source, including all of the headers and big blocks of characters all run together whenever you have a binary attachment. If you are using a recent version of Thunderbird use Help -> Troubleshooting Information -> Open Folder to open your systems file manager (Windows Explorer) at your profile. Otherwise read this article to figure out where your profile is stored. Then go to your profile directory using Windows Explorer. If you're not sure you found a Thunderbird profile look for a prefs.js file and a Mail subdirectory. If you're running Windows 2000 or later you may need to enable "Show hidden files and folders" and disable "Hide extensions for known file types" (its under the Hidden files and folders heading) and "Hide protected operating system files (Recommended)" in Tools -> Folder Options -> View to see it. You may get a warning message that your computer won't work if you do this. Changing those settings causes no harm, its really warning you not to change or delete any of the files or directories used to store the operating system. See this thread if you're running a older version of Windows. If the folder was in Local Folders or you used a global inbox it will be somewhere in the Mail\Local Folders directory within the profile. Otherwise look for a subdirectory named after the accounts mail server. For example, if you're using a Gmail POP account your inbox folder would normally be the "inbox." mbox file at Mail\pop.gmail.com. If you have multiple accounts with the same email provider the subdirectory might have a numeric suffix, for example Mail\pop.gmail-2.com. Ignore the .msf files, they don't have any messages. You want the files with the folders name and no file extension. Thunderbird uses *.sbd subdirectories to create a folder hierarchy. So a Local Folders\1\2\xyz folder would be stored as a "xyz." mbox file at Mail\Local Folders\1.sbd\2.sbd\3.sbd . That directory would also have a empty xyz.sbd subdirectory created in preparation for you someday creating a child folder of xyz. Ignore it. If you have "Allow Windows Search to search messages" checked in the options you will see *.wdseml files. If you are using OS X and enabled Spotlight Integration you will see *.mozeml files. Each file is a partial copy (up to about 49KB) of a message in the mail folder, stored in a .mozmsgs subdirectory. Ignore them. You only want the files named after the mail folder with no file extension such as "inbox. ", "sent." etc. Ignore them. Your folders are stored as mbox files in a profile. These are text files with the folders name and no file extension. For example your inbox folder is the "inbox." file. DO NOT try to import "inbox.msf" or "inbox.sbd" - the messages are in "inbox.". That naming convention causes a lot of confusion, it would have been a lot easier if the mbox files had a .mbx or .mbox file extension like some other email clients use. Decide what folder in either the Local Folders directory or a POP account that you want to import the folders into. If you're not sure where to import the folders the Inbox in Local Folders is a safe choice. You can not import the folders into a IMAP account (though you could move the folders there afterwards). Select that folder with the mouse in the folder pane. When you import the folders it will create a child folder (underneath the folder you had selected) and import them there. The folder pane is the vertical pane on the left that lists the accounts and their folders. If you don't see a folder pane you might need to enable it (View -> Layout -> Folder Pane in the menu bar) or add an account (if you just created a new profile, and don't have any accounts). Which option to use depends upon where the mbox files are stored. Most of the time you want to use the default ("import directly one or more mbox files"). If you want to import all of the folders in an account that has child folders "select a directory where searching the mbox files to import (also in subdirectories)" would be a better choice. If in doubt chose the default and repeat as needed later on to import the remaining mbox files. Thunderbird will import that folder (mbox file). It may add a suffix to make the folder name unique. For example, when I imported "inbox." into Local Folders it created a inbox679 folder. The previous sections explained how to import mail folders stored as mbox files. 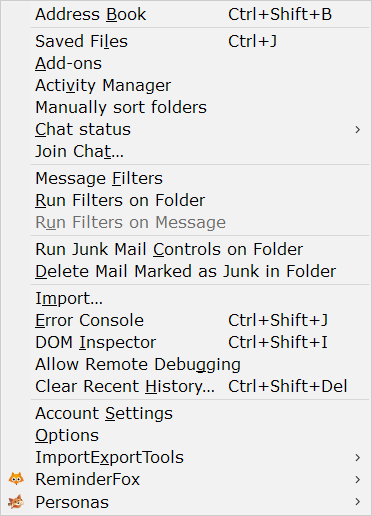 That is the default way to store mail in Thunderbird. Tools -> ImportExportTools -> Import Messages and "Import all messages from a directory" import .eml files. That is mainly used to import messages from other email clients that don't support mbox files such as Windows Live Mail. Thunderbird does support configuring an account to use maildir rather than mbox to store messages. Thunderbird's implementation of maildir stores all of the messages as individual files using the .eml format. Each file has a filename that is a string of digits and has no filename. 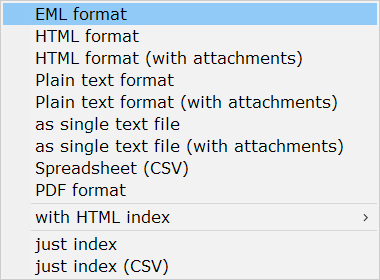 Because they don't have a .eml file extension you need to choose "All files" in the file picker. 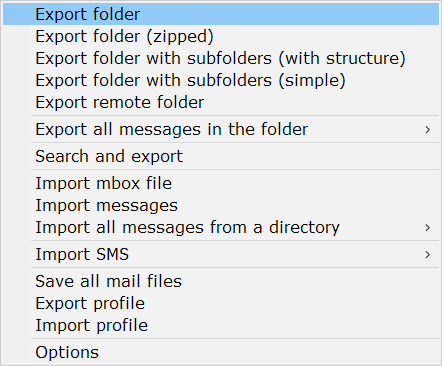 You could export your mail folders instead as mbox files using using Tools -> ImportExportTools -> Export folder, as *.eml files using Tools -> ImportExportTools -> Export all messages in the folder -> EML format (you could import them later on using Tools -> ImportExportTools -> Import All Messages from a directory -> also from its subdirectories), or in several different formats that are only meant to display the contents (can't import them). Don't worry if you don't see exactly what is in the screen shots above. The menus for the ImportExportTools add-on have changed several times. The Tools menu might change in future versions of Thunderbird. Its screen shot has four entries from other add-ons. Create/delete profiles or change the default profile using the profile manager. How to keep Thunderbird working smoothly. Moving your profile. Note that you can restore a backed up profile by moving it if you have the entire profile. Recovering a profile that suddenly disappeared. Storing your messages outside of the profile.